Rear Admiral Dave Oliver, USN (Ret. 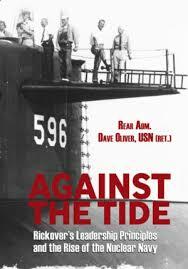 ), Against the Tide: Rickover’s Leadership Principles and the Rise of the Nuclear Navy. Naval Institute Press. 178pp. $27.95. Admiral Hyman George Rickover, USN, (1900 – 1986), has been gone now for almost thirty-years. Yet his legacy remains — and not only in the boats he built, or the submarine culture he shaped, or even the incessant attention to detail and excellence — but also the theatrical. Thus, most stories of the great man are told in either a tone of reverence or disbelief, but regardless, they tend to be entertaining. Officer: Hey, have you ever heard of Admiral Rickover and what he did when he interviewed officers for command? Me: No, I haven’t heard about him. What did he do? Officer: Well, Rickover would interview every prospective commanding officer of a nuclear submarine. So, this one time, an officer was in his office and Rickover said to him, “Do something to make me mad.” The guy looks at Rickover, and then he knocks everything off Rickover’s desk, including a valuable model of a submarine. Rickover was furious — but apparently it worked, the officer got the job and ended up commanding a nuclear submarine. Crazy, huh? A few years later, more stories would come up — and they always had something to do with his infamous interviews: Rickover stuffed officers in the broom closet next to his office if they gave a poor response to a question; Rickover sawed a few inches off the legs of the chair in front of his desk to confuse an officer interviewing for the program; and Rickover had no qualms about calling you an idiot. The best, and really the only complete transcript of a Rickover interview comes from the late-Admiral Elmo Zumwalt, who, as a commander, interviewed with Rickover in the late 1950s for command of a submarine. While Zumwalt passed the interview (although with a few stops in the broom closet along the way) he ended up going a different direction. He became the first commanding officer of a guided-missile frigate, and years later, the youngest chief of naval operations in U.S. naval history. His memoir, On Watch, is worth the price of admission for the interview alone. Early in the book, Oliver tells us one of the more interesting stories about Rickover and his ability to expect the unexpected. It is worth telling in full. The “giraffe” that this boomer had experienced was unheard of: “It was serious and was the first time this particular problem had ever arisen in the fledgling nuclear-power industry.” A message was immediately sent to Navy Nuclear Reactors. Rickover would find out about the problem — it was only a matter of time. Meanwhile, Oliver and the officers of the Carver sat down and tried to figure out a solution to the problem themselves, treating it as a real-world training evolution. In a few hours they came up with a solution. Oliver says that Carver’s solution took up twelve single spaced type-written pages. They thought that they had figured it out and then hit the rack. Hours later, Navy Reactors sent a message to “their sister ship” with instructions on how to proceed. The length of the message? Four words. And in those four words, Oliver says, they recognized its wisdom and — as a group — missed a safety consideration that just might have killed the entire crew. Years later, Oliver ran into Rickover’s deputy for submarines, Bill Wegner. Oliver says he thanked Wegner for that great four word response from what he assumed, was a group of Navy Reactor engineers. This pack of “emergency contingency plans” were there, sitting in Rickover’s desk, for the day the unexpected might happen. Why they weren’t already onboard boats in the fleet, well, Wegner went on to tell Oliver that “…Rickover was not interested in anyone else in the Navy knowing how far he was willing to stretch engineering limits in an emergency situation. 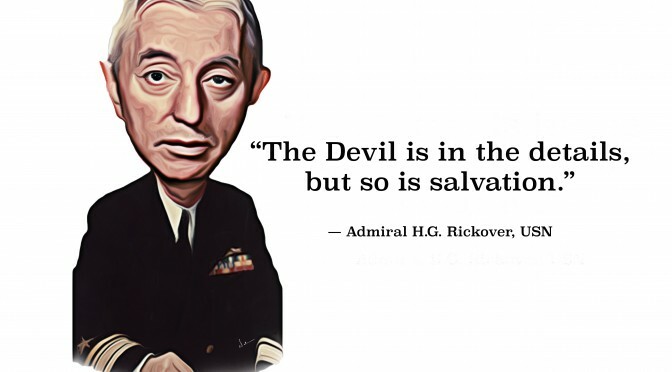 Rickover believed in operating conservatively and safely. In those envelopes he was going to give up a great deal of his safety cushion to provide an additional operating margin…” [Italics mine]. But not interested in letting anyone else know? A story like this, then, can be seen in at least two ways: Rickover the genius; a man prepared for all seasons. Or its opposite: Rickover was a micromanager that could have empowered his crews with information that in a different and deadlier circumstance could save their lives. What does Oliver say at the end of this story? He asks two of his own questions for the reader to ponder: “Do directors of companies sometimes accept risks they cannot evaluate until the bell tolls? And second, how do leaders avoid fooling themselves about the true condition of their own start-ups?” Oliver ends every chapter with these kind of questions for self-reflection or discussion. However, it would be nice to also hear Oliver’s take on the same questions he asks. Leadership books that dip into the anecdotal stories of great men and women’s lives are often hagiographic. Oliver, as he says, respected Rickover second only to his father. This admiration does not necessarily take anything away from the value of the work or the merit of Rickover’s principles. But for every leadership book that sits on the shelf it is important to remember that one can learn just as much about leadership from a leader’s failures and shortcomings. Rickover was a paradox on this count. Oliver reminds us that one of Rickover’s mantras was “Do the right thing.” Yet in 1986 Rickover was censured by the secretary of the navy for accepting over $60,000 in gifts from General Dynamics (twelve shower curtains?). Rickover did not deny it, and he would later say that his “conscience was clear,” the gifts, he said, never influenced his decisions when it came to the submarine force. Rickover was a contentious man, a brilliant man, and he had magical bureaucratic skills and vision: Imagine Peter Drucker and Steve Jobs all rolled up into one slight, white haired, five foot wiry frame. And he could write. Name a flag officer today that can wrap up Robert Browning, Walter Lippmann, I-Ching, Voltaire, Ralph Waldo Emerson, Teddy Roosevelt, and Aristotle into a single cogent essay. Lieutenant Commander Christopher Nelson, USN, is a naval intelligence officer and recent graduate of the U.S. Naval War College and the Navy’s operational planning school, the Maritime Advanced Warfighting School in Newport, RI. LCDR Nelson is also CIMSEC’s book review editor and is looking for readers interested in reviewing books for CIMSEC. You can contact him at books@cimsec.org. The views above are the author’s and do not represent those of the US Navy or the US Department of Defense.